The conversation with Andrea King, born in 1919, like Lex Barker, will be the first interview contribution to the 100th anniversary of Lex Barker's birth. The actress was among Barker's closest circle of friends during the 'Golden Years of the Cinema' in Hollywood. Andrea King would have celebrated her 100th birthday this 1st February 2019. Andrea King's year of birth is 1919, just like Lex Barker's. On February 1st she was born Georgette André Barry in Paris, and at two months of age arrived in the United States with her American mother. At the age of forteen Andrea played in a school performance and made such a good impression that she caught the attention of theatre producer Lee Shubert. Via New York's Broadway, the path of the young beauty led to Hollywood, where she signed a contract with Warner Brothers. Under her stage name, 'Andrea King', the adaptable young woman starred in many movies and thus her career advanced remarkably fast. 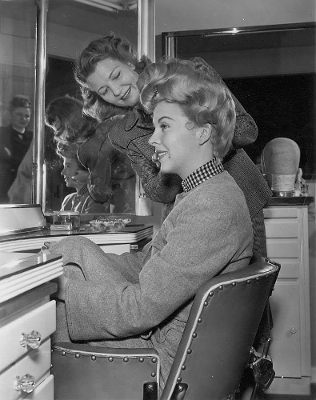 In 1945, Warner Bros.' photographers depicted Andrea King as the most photogenic actress of the studio. 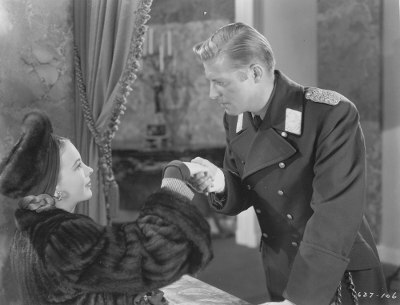 In Vicki Baum's Hotel Berlin (1945) Andrea starred, for the first time, in the lead role. The critics saw her, portraying the character Lisa Dorn, as 'deadly, charming, and remarkable'. For Andrea King it remained her favourite movie, because it made her a 'leading actress' — thanks to a role written for an actress of Bette Davis' calibre. But politics spoilt her enjoyment of the moment; because her blonde actress colleague, Faye Emerson, married the son of US President Roosevelt during filming; Andrea was forced to take a step back during the publicity campaign. Nevertheless, Andrea King soon became a glamouros leading actress, often cast in mysterious roles. 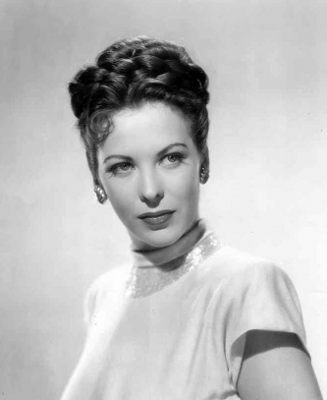 Her most famous movies are: The Beast With Five Fingers, Shadow of a Woman (both 1946), and Ride the Pink Horse (1947). In the latter, a 'film noir', King depicts the 'femme fatale'. 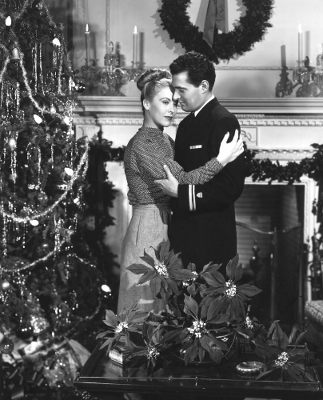 With very attractive and clever means her character attempts to bewitch that of the leading actor, Robert Montgomery, on the big screen. Although Andrea King, regrettably, never got her 'big break', she remained active in the film and television industry until old age. During the mid-1940s, Andrea King and her husband, lawyer Nat Willis, counted among the closest friends of Lex Barker and his wife Constance. Lex and Andrea loved to play 'charades', or pantomimes. Nat Willis also represented Barker in legal matters, such as the divorce procedings against Arlene Dahl, or as best man during the civil wedding of Lex and Lana Turner. In 1947, Andrea King and the German actor Kurt Kreuger accepted the roles of godparents for Lex Barker's first son, Alexander Barker III, or 'Zan'. Kreuger later remembers: "Lex and his wife asked Andrea and me. Zan was baptized; Andrea King and I were the godparents, and we both attended. I cannot remember the place; it was in some church, but I have no recollection of where it was. Lex was a member of a protestant denomination." Annotation: Author Paul Miles Schneider, a close acquaintance of the actress, captured the fascinating life story of Andrea King and her mother Belle McKee in the very interesting biography 'More Than Tongue Can Tell'. The following interview was conducted in 1999 in Hollywood. What memories do you connect to Lex Barker? We were tennis partners. That was very funny, because Connie, his wife, loved tennis; but she had the longest legs, and they weren't very suitable for the tennis court. And Lex, who was an absolute perfectionist at tennis, said to me: “Oh, God, Andrea, couldn't you arrange it, so that we can play together and I won't hurt Connie's feelings?” And that's what we did. We played doubles at least three times a week, with all the young men — Gilbert Roland, Cornel Wilde — so many of the young actors. Back then, tennis was the fashionable sport of the day in Hollywood — like motorbikes and other things that are no longer anything special nowadays. In any case, Lex was a great sportsman, and we were always together as a family. It really was like a family; we were all from New York and used to stick together, within the 'family' that lived in California at the time, and we've been meeting constantly. Why was there never a movie with you and Lex Barker together? I've never worked with him. We hoped to be able to be in front of the camera together one day, but then the studio system fell apart and everyone went their separate ways. Of course we've often visited each other on set, and crossed paths in wardrobe, or ate lunch in the cafeteria together. On Warner's studio plot there was a tennis court, and when we had a few hours to spare during filming, we played tennis together.